Perfect for a romantic weekend getaway in Ohio, Ashley's Island House welcomes you to experience the warm and comfortable accommodations of this country inn. Hardwood-floors, lofty windows, paddle wheel fans, and antique furniture and lighting recreate a warm and comfortable 19th Century feeling in each of our twelve guest rooms. Each room has its own unique personality and all are centrally heated and air-conditioned. All rooms have shampoo, soap and Blow dryers. Guest are welcome to make themselves at home in their private room as well as in the Bed and Breakfast's public sitting room. Each morning, guests of the Inn are served a large continental breakfast to jump-start their day of exploring Put-in-Bay, OH. Ashley's Island House is located within walking distance of all the local fine shops, restaurants, entertainment, churches and other historical buildings. Guests can enjoy a leisurely walk around the island, a bike ride along the countryside or a tour of our local winery. Enjoy fishing, swimming, or boating on the lake. 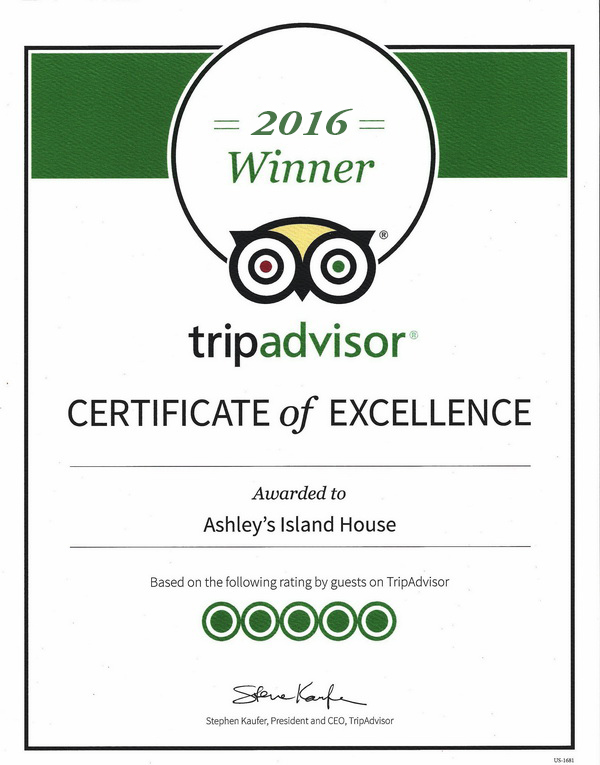 Just returned from a two night stay at Ashley’s Island House and it was a wonderful experience! Owner was there when we arrived and, since it was our first visit to the island, he gave us an island tour on one of their golf carts. Our stay just continued to be top notch during our entire visit. They had a cancellation and since that room was larger than our booked room they offered us that room - which I thought was a very nice gesture. Also really enjoyed making new friends with all the guests on the porch. Other notes: Renting golf carts from Ashley’s is the way to go. It is an easy walk from the Jet Express ferry and since it was raining when we departed, they even gave us a ride back to the port! We aren’t huge party people so we were happy that we weren’t on the island on a weekend. Arriving Sunday afternoon was perfect and enjoyed laid back atmosphere of the island on the weekdays. Island life does not get any better then when you stay at Ashley's Island House. The rooms are clean, well maintained. The breakfasts in the morning is awesome. The location is outstanding with in walking distance to the bars and restaurants. In the evening or late afternoon you can sit on the front porch and relax or you can go bike riding, bikes are included with the rental of the rooms. In one word FUN! I have been coming to Ashley's for 10+ years. First off, I just have to start off with saying that Lori, the owner's mother is fantastic. After an overnight stay and riding our bikes 2 miles to the dock and riding the ferry back to mainland from the island, my wife and I discovered to our horror that my car keys weren't in my backpack. I called Ashley's and asked Lori to check our room. Sure enough, she told me they were there. As I envisioned taking a solo journey back across the water, riding my bike back to the inn to get them, she didn't hesitate to suggest that she would take them down to the dock in her golf cart and have the next boat bring them to me. I was so grateful... Instead of what promised to be a several hour ordeal wound up being resolved within 40 minutes of me calling her. That was the capstone on an otherwise great stay at Ashley's for our birthdays, which was already a repeat visit. We stayed here last summer for two days in midweek (much more sane--yet still fun--than weekends at PIB), and loved this place. We learned that the inn had changed owners since last year. Yet it still has the same comfort, cleanliness and charm as before. Lori's son was injured shortly before we arrived so she was managing the place solo as he was getting himself fixed up, yet she still did a great job. Best of luck with everything!